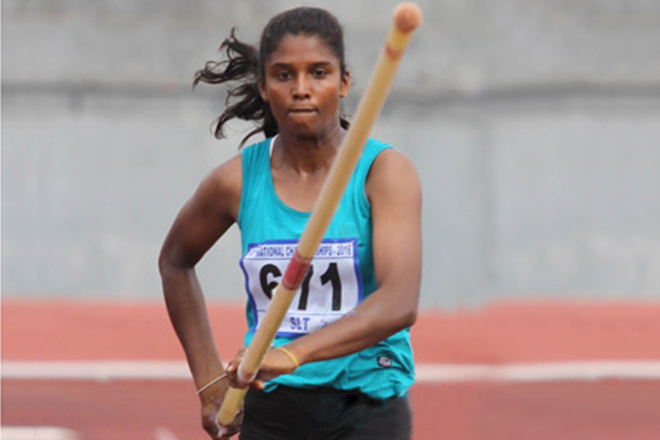 Lankan vaulting queen Anitha Jagatheeshwaran once again renewed her own Lankan record in the Pole Vault at the 43rd National Sports Festival held in Matara. Anitha made a Lankan record less than a month ago at the National Athletics Championship with went over 3.48m. Trained by C. Subashkaran, Anitha had been instrumental in the event during recent years and AASL had even sent her for an international competition making it the first such instant in history where a female pole vaulter was exposed to international competition. Anitha was selected to the University of Sabaragamuwa Sports Management Degree but gave up the idea at the thought of having to move away from her coach which would have also affected her athletics career. She is yet to learn the proper technique in the pole vault but she still clears these heights just like someone who started vaulting with an ordinary pole. Proper technique would see her jumping greater heights with lesser effort. Anoma Karunawansha from Eastern Province placed second by 3.10m and the third was S.D. Ranasinghe 3.00m from Western Province.